Ride-On Motorcycle Formula Tire Sealant (Tyre Sealant) for Motorcycles has been designed for use in high speed applications without causing vibrations. Ride-On also helps improve tire balance, seals punctures from objects up to 1/4" (1/8" for tubes) in diameter, prevents flats, helps tires last longer and inhibits wheel corrosion. 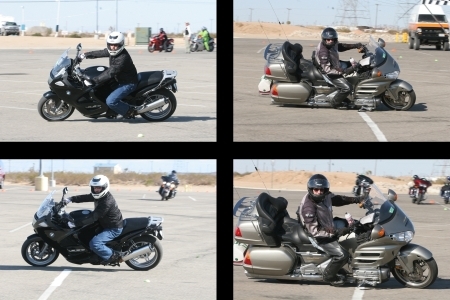 Get a 10% discount by clicking on THIS LINK and using ridingworkshop as your promotional code. Whether it's a cruiser, sport bike, touring bike or adventure tourer, Avon Tyres have the traction and performance to see you through. Click on THIS LINK to learn more about Avon Tyres. Whether you're looking for the perfect gloves or the best under-gear, you owe yourself a visit to Lee Parks Design. Lee carries a whole range of CONDOR products to make transporting your bike easy. His DEERSKIN GLOVES make every ride pure pleasure and his BAMBOO APPAREL feels even better than silk. Click on THIS LINK to find some of the best motorcycle gear available today.